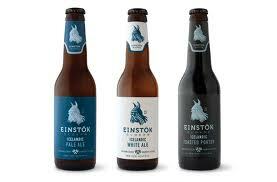 Three American entrepreneurs have launched the label Einstök Beer (einstök means “unique”). The product, which is brewed in the Víking brewery in Akureyri, north Iceland, will be sold as craft beer in foreign markets. The product, described as “Icelandic Pale Ale”, will soon be available at markets reaching 40 million consumers and the plan is to make Einstök the country’s best known export product in the next three to five years, Morgunbladid reports. The entrepreneurs, Bernard LaBorie, David Altshuler and Jack Sichterman, intend to use the country’s image in the marketing campaign, reasoning that unlike most other beer labels there is no need to exaggerate Einstök’s links to purity and beauty. The project started when LaBorie, who wanted to create a new label for a beverage, went looking for the world’s best water. “His quest ended in Iceland. Then he contacted me and David Altshuler,” Sichterman said. “For example, there is often not much behind statements on the purity of the water or the masculine image which they try to create around their beer labels, but here in Iceland all of this exists and more,” Sichterman explained. Internationally, there is a growing market for craft beers, which appeals to individuals seeking more versatile flavors in beer than those offered by large international labels. Craft beer, or hand craft beer, generally refers to specialty beers brewed in local breweries or in bars and restaurants.